Fueled by beer and the enthusiasm of amateurs, a British team on Friday said it was preparing to launch the world's first ever 3D printed rocket. 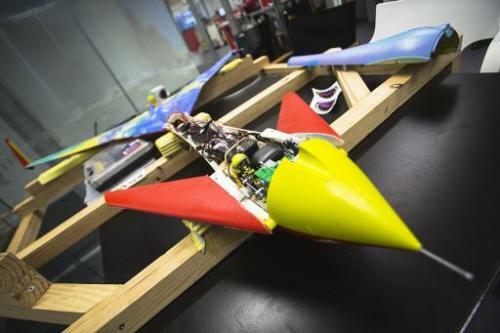 Showing off the human-sized rocket in a central London office, Lester Haines, head of the "Special Projects Bureau" at technology magazine The Register, described the technical challenges and "big future" of 3D printing in aeronautics. "You can do highly complex shapes that simply aren't practical to do any other way," he told AFP, dressed in a white lab coat sporting the project motto "Ad astra tabernamque", which means "to the stars and the pub". "NASA are already 3D-printing metal rocket parts, so it's obviously got a big future." The project—sponsored by German data analytics firm Exasol—was suggested by readers of The Register and goes by the grand title "Low Orbit Helium Assisted Navigator", or LOHAN for short. It took 30 committed team-members, including doctorate aeronautical engineers, four years to build the rocket. The biggest challenge, according to Haines, was getting the standard hobbyist rocket motor to fire at high altitudes. The team said it will launch the rocket from Spaceport America, the home of Virgin Galactic in New Mexico, later this year, after securing the £15,000 ($24,000, 19,000 euros) needed for lift-off on crowdfunding site Kickstarter. A huge helium balloon will lift the rocket 20,000 metres (65,600 feet) into the stratosphere, at which point the onboard GPS will ignite the engine, catapulting it to speeds of around 1,000 miles (1,610 kilometres) per hour. The three-kilogramme rocket, which cost £6,000 to print, will then use an onboard autopilot to guide it back to Earth, all captured by an onboard video camera. Haines explained how 3D printing's main advantage was in speeding up the process of refining prototypes, requiring only a tweak to the computer-aided design (CAD) plans that instruct the printer. He called LOHAN "a because it's there project", and had no commercial value, but added that the number of potential uses for similar Unmanned Aerial Vehicles (UAVs) was "endless". With the countdown on, Haines dispelled any suggestions the crew was feeling the pressure. "We got some of the team turning up for a beer tonight," he revealed. "It's going to get really messy."